Daybreak on Oct. 20, 2009 finds NASA's towering 327-foot-tall Ares I-X rocket slowly making its way up to Launch Pad 39B at NASA's Kennedy Space Center in Florida for an Oct. 27 test flight. CAPECANAVERAL, Fla. ? A prototype version of NASA's newestrocket is ready for its planned Tuesday launch, mission managers said today. 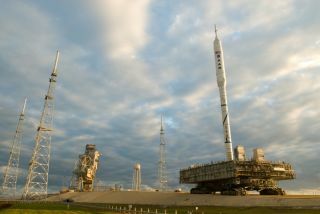 NASAis set to test the design of its next-generationrocket, Ares I, during a demonstration liftoff called Ares I-X. The launch,slated for 8 a.m. EDT (1200 GMT) on Oct. 27 from Launch Pad 39B at Kennedy Space Centerhere, will be a suborbital flight of the new rocket's first stage, with a dummysecond stage and mock crew capsule on top. NASAofficially gave the go-ahead for Tuesday'slaunch after a Flight Test Readiness Review meeting among mission managers. "Theteam is ready to go fly," said Bob Ess, Ares I-Xmission manager, at a briefing following the meeting. "The vehicle isactually ready to go fly." Butthe weather outlook for Tuesday is iffy, with only a 40 percent chance offavorable conditions expected. NASA requires clear skies for the launch so thatthe rocket's flight is visible and detailed data can be collected. "Weatheris always a challenge and next week will be no different," said Ed Mango,Ares I-X launch director. "But we?re five days out and a lot can change inthose five days." IfNASA can?t launch Ares I-X on Tuesday, it can try again on Wednesday. On bothdays, the rocket only needs about 10 minutes of good weather sometime between 8a.m. and noon EDT (1200 and 1600 GMT). TheAres I rocket is NASA's chosen rocket to replace the aging space shuttle fleetas a vehicle to carry astronauts to low-Earth orbit. Butwhether NASA will actually build Ares I hinges on an upcoming decision byPresident Barack Obama?s administration, which is currently assessing theresults of an independent review of U.S. human spaceflight plans. The reviewpanel releaseda final report Thursday that raised the possibility of nixing Ares I andencouraging commercialaerospace companies to build a crew-carrying launch vehicle. That wouldallow NASA to focus on designing the technology and heavy-lift rocket to takehumans to the moon, Mars, or nearby asteroids, the panel said. "Weare happy that the report is released and we have that to work with," saidDoug Cooke, associate administrator of NASA's Exploration Systems MissionDirectorate. "We are assessing our options. No decisions have been made atthis point." Whetheror not the new rocket is approved as part of NASA'sfuture goals, the Ares I-X test marks a major milestone for the agency. This is NASA's first test flight for a new crewlaunch vehicle since the first space shuttle was launched in 1981. Cook saidthe flight is still vital to NASA even if Ares I isnot in the cards for the agency's future. "Webelieve, and actually feel very strongly, that this test is very important fora number of reasons," Cook said. "Even getting to this point todaythis team has learned about getting a vehicle designed and ready to launch, andit's really an inspiring point to be at ? The data is important to us regardlessof what comes next."